Yesterday my school, Piedmont Baptist College, announced that they are changing their name to Piedmont International University. Because I am not on campus this year, because I am doing an internship in Ohio, I got the news through my friends tweet’s on Twitter. When I first saw the first few tweets I wasn’t really sure what to think, but the more I thought about the name change the more I really liked it. I like the name change for two reasons. First, I am glad “Baptist” is not part of our school’s name anymore. Before anyone who is a Baptist reads this and get mad, let me explain that I do not have anything against Baptists. I grew up in a great Baptist church. I learned to love God and walk with Him in that church. I also got most of my ministry experience in that church and God used that church to call me into full-time ministry. With that being said, I do not hold to “Baptist” very tight. I am not a big fan of denominational titles and groups anyways, but if someone would to ask me if I am a Baptist or not I would say yes because I agree with most of the Baptist distinctions. If someone doesn’t ask me, than I will not even bring “Baptist” into the conversation because I do not see it as a “closed hand issue.” Also, getting “Baptist” out of our schools name can help some of us students who are not pursing a Baptist church for full-time ministry get a job. Since the beginning of summer I have been up North, PA and OH, doing internships to finish my degree. The moment you leave the “Bible belt” not many people have even heard of PBC and then when they hear “Baptist College” you lose a little bit of credibility. I am not saying that it is all about titles or about “looking good,” but it does help some of us who are pursing a ministry job outside the Baptist circle to be from a school that is a university. Effective January 1, 2012, Piedmont Baptist College and Graduate School is planning to change its name to Piedmont International University. Acquiring university status is only the latest in Piedmont’s steady progression from our original name of Piedmont Bible Institute. 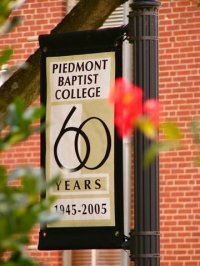 The institute progressed to become a college (Piedmont Bible College for most of our history), and the college progressed to the point of adding a graduate school (eventually being called Piedmont Baptist College and Graduate School). Over the past decade Piedmont has doubled in enrollment, added a nice variety of new graduate and undergraduate degree programs (including a PhD in Bible), launched branch campuses in two other countries (one is still a teaching site), created an online Spanish version of our Master of Arts in Biblical Studies, developed a world class online school, and restructured Piedmont with four distinct academic schools. All of this has propelled Piedmont into the exciting position where we can now obtain university status. The university label should also be less confusing to prospective students from other countries where “college” is synonymous with high school. Speaking of other countries, Piedmont has historically placed high priority on missions and world evangelism. Scores of our graduates serve our Lord Jesus Christ in gospel ministry on every inhabited continent, and more and more nationals from around the world are enrolling via our world-class online school. Our graduates who desire to serve in Restricted Access Nations (where Christianity is illegal or missionaries are not allowed) and nationals who would enroll from those countries have repeatedly told us that any religious sounding name is detrimental to their efforts or even dangerous. Terms like “Baptist,” “Christian,” or “Biblical” are wonderful to us, but they are not very endearing to an immigration officer in some place like North Korea or Saudi Arabia. Just today I spoke with the gentleman who gives oversight to our teaching site in Bangladesh. He was elated by the fact that he would no longer have to explain the term “college” to people who think it means high school, and he was very excited about not having to worry so much about having the government coming after him if they found out he was connected to a Baptist/Christian school. Piedmont International University won’t raise the red flags like a religious name might. Although Piedmont International University does not sound religious, it is very important to our Board, Administration, Faculty, and Staff that everyone knows our passionate desire not to stray from our original mission of quality Bible teaching and effective ministry training. We will continue to require a Bible major for every person seeking a Bachelor’s degree in any discipline. Piedmont’s theological foundation is more important than ever, and we have every intention of equipping our students to interact with a constantly shifting and pluralistic world by anchoring them with a literal, grammatical, contextual, historical hermeneutic for accurate Bible exegesis resulting in sound theology. In short, we will honor our Biblical heritage and Baptist distinctives while tenaciously contending for the faith. With some of those ideas in mind, our governing Board of Trustees voted to approve our new name, Piedmont International University. Finally, please join us in prayer for Piedmont International University. I “cease not to give thanks for you, making mention of you in my prayers” (Eph. 1:16). As Paul mentioned in many of his letters, we must constantly overlook one another’s faults to thank the Lord and pray for one another. As a brother in Christ, I greatly respect and cherish your point of view on the issue of PBC’s name change. However, I do have some issues with your reasoning behind the term Baptist. Since your blog post has been opened to all, I will accept the invitation to comment accordingly. Before I begin, please understand that my comments are not directed toward those who participated in the name change or even PBC in general, but toward the comments you made about the name change and the term “Baptist.” First, I would like to point out that the term “Baptist” did not evolve from a set of distinctives but from conviction – A conviction that I happen to hold tightly with regard to the English separatists’; however, I respect your right to hold them loosely. I cannot say that I endorse all Baptists, and for that matter all Christians. Secondly, I would like to say that if you are not going to label yourself under any denomination and claim to be pan or non-denominational then you are labeling yourself as such and ultimately confuse some as to what you believe. In this day it is not affordable to blur or even erase the lines for the sake of unity or advancement – doing so ultimately leads to dismissal of doctrine. I agree with you that we are first of all Christians and there is no denomination that does not carry some type of negative baggage. Unfortunately, the name Christian has that baggage too. Are we to no longer label ourselves “Christian?” That is an emergent theology and mindset and very dangerous. Finally, there are many colleges that offer Bible curriculum that refrain from using the name “Baptist.” I chose PBC because it was a Baptist college. I had no desire to earn a title or only pursue a degree (not insinuating you did) – I sought education and training, which I received much of and thank God for! You really contradicted yourself when you said: “It is sad to say titles matter this much, but let’s be honest, people do look at titles.” That is a true statement and I am standing behind the title of “Baptist” because titles do help others know what we stand for. Baptists throughout history have been known as those who hold to biblical truth and standards that endorse biblical separation and I am going to continue to support the title and challenge you to evaluate your reasoning mentioned in your post. In conclusion (I know…”finally” and “in conclusion” – it’s just the preacher coming out in me), we must look at the “telos” of where dismissing all denominations lead. If we are not careful we can fall into the dangerous assumption that the “end justifies the means”. Jamie, if you took a job at a church named Anytown Bible Church or Anytown Community Church that had strong doctrine, great missions, and was centered on Christ, would you feel it part of your conviction to call a congregational meeting and modify the church’s charter, renaming it “Anytown Baptist Church”? If so, would you be able to support that move biblically, or just preferentially? And if not, then what’s the difference doing the opposite? I appreciate your input and consider your question to be thought provoking. First of all, I was not raised a Baptist. Secondly, I choose to affiliate with the Baptist denomination due to convictions based upon Scripture. I have served at what some would call a non-denominational church. The church was and still is all you mentioned according to doctrine, missions, etc. and I had no desire to lead them to a name change. However, “non-denominationalism” has become a label in itself. If we were to remove all banners then where would we be? I would never buy a product in a plain wrapper without knowing what is inside. The label tells us what is “suppose to” be inside. I will agree that labels can be deceiving but also very helpful. If we are throwing out, or ashamed to be identified under certain labels then we should consider the label of Christianity. As I mentioned in my earlier comment, there are many that I do neither affiliate nor agree with that abide under the banner of “Christian.” After all, which is worse…being a Baptist, Presbyterian, Methodist, etc. or proud of not being affiliated with any so-called denomination? I preach the gospel, not a religion or denomination. I am first of all a Christian (a term given to those who were Christ like) – secondly, I am a Baptist (a term given to those who stood firm on biblical doctrine). The only thing I can boast in is the cross, not in being a Christian or a Baptist. Therefore, I see no need in removing or adding any label for the sake of unity or promotion where doctrine is not compromised an inch. When that is done, doctrine is the one that usually gets tossed. Thanks for the discussion! Thank you Jamie for taking the time to read it and giving me your opinion. This is an important issue that if given more thought I might think differently about it later. Your thoughts and statements in your comment were very thought-provoking and enjoyed reading your comment. Hope your doing well and going strong! Thanks, Austin. Again, I was not at all trying to be antagonistic toward your view, just trying to provoke thoughts on the reasoning. I am doing well and enjoy reading your posts from time to time. May God bless in your ministry! I am amazed and blessed by your positive response to Jamie Sink’s comments. I guess I expected some fireworks, like you would with some blog interactions. But I must say, you displayed godly savvy there. Now, my thoughts. I lament the trend of many fundamental baptist seminaries nowadays discarding the name, “Baptist.” There’s Asia Baptist Theological Seminary (under Cornerstone University/ABWE). Now, they call themselves, “Asia Biblical Theological Seminary.” “Grand Rapids Seminary” used to be “Grand Rapids Baptist Seminary.” And now–Piedmont. I understand the practical and missional reasons for the name change, but the theological reason seems shallow. It seems that only the Southern Baptist Seminaries are left sticking faithfully to the “Baptist” name. The Northern Fundamental Baptists have changed their flags. The other Fundamental Baptists in the Bob Jones or Southern orbit seem to stick to the name. I wish that we should stick to the name, “Baptist.” It is a biblical name, although not exactly an apostolic-authorized name. I was raised Catholic, but became born again in a fundamental baptist church in the ABWE orbit. After spending more than twenty-years with the Baptist Conference of the Philippines (planted by the Baptist General Conference, which now is called, “Converge Worldwise”! ), an independent baptist church called me to be their pastor. That church has no baptist name in their articles of incorporation, but it operates, believes, and teaches like any Bible-based Baptist church. Its affiliated denomination still retains the Baptist name. The point is that people will stumble or stand up with a name, and be blessed or cursed by it. I agree with Jamie. It’s an endless cycle. The “Christian” name used to be derogatory, but now accepted by everyone (or vice versa if you will). Do we change it then? The name change will be an endless cycle. But then again, I think it’s part of the evolution of religious movements. In sum, I prefer the Baptist name, although for practical and missional reasons, a name change might be appropriate. If the trend continues, the Baptist movement will morph into different names, making the name, Baptist, no longer as monolithic as it used to sound. I can safely predict that for those Baptist denominations that have dropped the name, Baptist, future generations will no longer appreciate the Baptist name and worse, remember the name as only part of a distant past, if they remember it at all. Good stuff, Austin. I happen to like the name change as well. I personally would’ve titled it Piedmont Biblical University (that was a possibility among the voters), but that isn’t my responsibility. I’m actually the opposite of you in relation to Baptist churches, I was part of an IFCA church (Independent Fundamental Church of America). Some people are greatly offended by the word “Baptist” taken out of the title, but it doesn’t bother me whatsoever. In all reality, Piedmont is still a “Baptist” college because it holds in its doctrinal statement to the Baptist distinctives in doctrine. Likewise, Piedmont is still a “Bible college” in the sense that ALL undergrad students will enter their careers with a Bachelor’s Degree in Bible. Yet, the “title” is Piedmont International University. I’m looking forward to see how Piedmont moves forward. My history with PBC goes back to 1979 when it brought my dad here. While I never attended PBC, many of my friends did, including my wife. I grew up going to church and school at Salem, though ultimately graduating from Gospel Light since Salem was only up to 8th grade at the time. I’ve been thrilled with the changes at PBC lately. I feel like they are embracing more Godly principles and less tradition and posturing. There are still colleges for those who want to align themselves with certain groups- Bob Jones, Pensacola, Tennesee Temple, Hyles-Anderson, but PIU has a newly rediscovered mission to reach more people with the real Gospel, not a fake religion for the pious. And about that sign- “The sun never sets on the influence…..” Clearly modeled after the high and mighty statement regarding the British Empire, that saying confirmed all my suspicions about their compulsion to distinguish themselves with superficial things. That hurt me for a college that had such meaning in my life. I wouldn’t care what they changed the name to, as long as it got rid of that old sign! I appreciate your comments. I was raised in a non-denominational church, founding in the 1930’s as a Fundamentalist ministry on three distinctives: the Bible as the sole rule of faith and practice, salvation by grace through faith alone, and the premillennial return of Christ. The church started as a bi-weekly Sunday school, rising out of cottage prayer meetings and out of the vision of a Methodist man. Essentially, the ministry put out the call, “If you are biblically conservative in this town, you are welcome here.” Over the years, the ministry had a lot of input from Baptists, Plymouth Brethren, even now-born-again people raised in the Disciples of Christ denomination. These brought with them various elements which positively influence the church culture to this day. The Methodists brought with them that piety which is so needed in this day. The Baptists brought with them the more practical “push” in preaching which is often needed to help someone over the line in salvation. The Plymouth Brethren, which had a good deal of influence, brought with them the mentality that the church should be (and is) more of a spiritual organism than one of legality, church covenant signatures, and membership documentation. Even the converted Disciples of Christ influence (of which my father was, even as aberrant as that denominational influence is without the saving grace of God) brought a certain culture of good ethics which is very fitting to those who have been converted through saving faith in Christ. In sum, all members there are very thankful to have found the true Gospel as given by God’s Word. We all dearly love our church. My church has supported Piedmont all my life. I was actually quite surprised to find out recently that Piedmont had, at one point, adopted the name “Baptist.” I was more surprised to find out that the origins of Piedmont were primarily Baptist. This latter is OK; I’m just saying I was surprised to hear it. The mentality I was inculcated with, not only by my church but by other Christians in my family and circle, was one of looking beyond denominational titles to the true matters of the Bible, saving faith, love of God from the heart, and evangelism. Is this not what original Fundamentalism is? (Now, some would say: shouldn’t you also include biblical accuracy, and this not divorced from carrying the overall good and biblical spirit of the Christian life? I reply, of course I include them, but I mean to say that these former definites are what my predecessors gave me.) I came to be baptized after my salvation, not because I was Baptist but because the Bible commands born again people to do so — to be visibly identified with Christ and thereby to be welcomed into the visible church. This was the original mentality of the English Baptists, and among them I would probably join, if I were present in their day. At this point, as a graduate of BJU, I am now considering more graduate work at Piedmont. Were Piedmont still identifying itself as a Baptist college or university, I would have much reserve persuading myself to pursue a degree from a school whose name would seem to tie me into those things that accompany calling oneself Baptist today. I do not at all desire the added weight of calling myself Baptist in the modern delineation of that title, though I dearly love my friends in Baptist churches who are perfectly OK in conscience with calling themselves such. For me, “Baptist” is an unnecessary addition to the life I already enjoy in Christ since salvation, and honestly I would struggle to carry it.